Diving can be one of the most exciting and rewarding activities you will ever experience. However, like most exciting activities, there are rules and procedures you must follow. Proper training is crucial to minimize risk and maximize enjoyment. Breathing in an underwater environment can be dangerous, or even deadly, if you don’t know the rules or if you chose to ignore them. Brownie’s provides Online Training free with the purchase of each recreational hookah system. At Brownie’s, we want all our customers to be as educated and as safe as possible while in the water. We provide this training program at no additional cost with each system to make learning easy, convenient and fun! The program is an interactive, web-based learning course designed to teach you how to properly and safely use your hookah system. It is broken down into 7 modules each with specific Knowledge Requirements and Objectives. The course utilizes a variety of written explanations, illustrations, photographs and streaming video to clearly convey each subject. Brownie's makes it easy for students of all ages, including children, to enjoy learning. Upon completion of the Online Training Course a diploma will be shown on-screen, ready to print, frame and proudly display. Hold onto your user name and password so you can access your online course anytime you want to review. Now you are ready to "get wet" for your in-water portion of training. You can purchase additional hookah course sign-up codes for friends or family from your local Brownie's Third Lung dealer. Brownie’s Third Lung, the world leader in recreational surface supplied diving systems, has partnered with Scuba-Training.net to develop and deploy an online diver-training course for our world-class surface supplied diving systems. Brownie’s will include the academic portion of hookah training with the purchase of each surface supplied diving system and select accessories at no additional cost. A non-certified consumer will now be able to purchase a hookah system and proceed through the academic training online, at his/her own pace. By removing three of the most common barriers to new divers (cost, convenience and time) Brownie’s estimates this new program could result in an inrush of new divers. Have your certified dive instructors/store managers download affiliate application form. Fax the completed application, along with proof of certification and current insurance to 954-462-6115. Upon verification, they will be issued a free “Sign-Up Code” for access to the affiliate area of the scuba-training.net website. 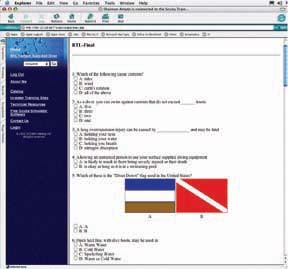 The quizzes and exams are given online, so they can complete the course at their own pace. Upon successful completion of the online instructor’s course, Brownie’s will be notified of your qualification as an active status Surface Supplied Instructor / facility. You will be included in the list of training facilities in your region offering Hookah training on scuba-training.net and be kept on file at Brownie’s Third Lung for referrals to inquiries by new customers. ontinue selling Brownie’s Third Lung systems, add-a-diver kits in addition to extra access codes for other family members and friends plus the in-water portion of dive training. Dive retailers may charge whatever the market will bear for their in-water instruction time and are freed from the repetitive, tedious and time-consuming classroom sessions. 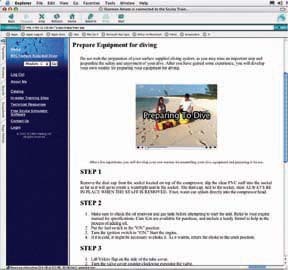 With the academic portion of the surface supplied diver course completed online, the instructor has time to focus on developing the crucial in-water skills. What services are you expected to provide for the customer? •	Verify he/she has successfully completed the online course. •	Review any topics he/she requests or may have had difficulty with during the course. •	Verify he/she is physically able to dive and has reviewed the contraindications to diving. •	Verify he/she is can correctly configure his/her hookah system. •	Teach, review, verify in-water skills. What equipment do we use to teach this program? Most customers will complete the online course after the purchase of a Brownie’s Third Lung Hookah System. You should use the customer’s equipment to better familiarize him/her/them with handling and set up / break down. The scuba industry verifies diver certifications as the diver comes into the dive store for air fills or contracts for dive charters. There is no such interaction with hookah diving systems. Once the system is purchased by a consumer, he might not ever have an inquiry about his training or diving experience. 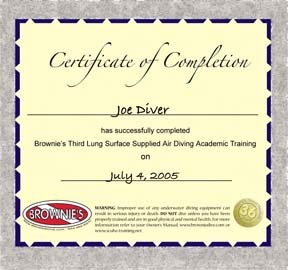 Brownie’s determined that the most prudent course of action is to provide free training with the purchase of any Brownie’s Third Lung diving system. Contact Us for more Brownie's Third Lung Online Training information.